Wood Eats! Happy Birthday Party Cake You've planned the perfect birthday party, now it's time to cut the cake! Pick up your serving tool and listen to the SCRRTCH as you really slice the pieces apart! How many pieces make a whole cake? Oh! Did you remember the candles? Do you know how many you need to add? Count them out: 1, 2, 3, 4, 5... perfect! 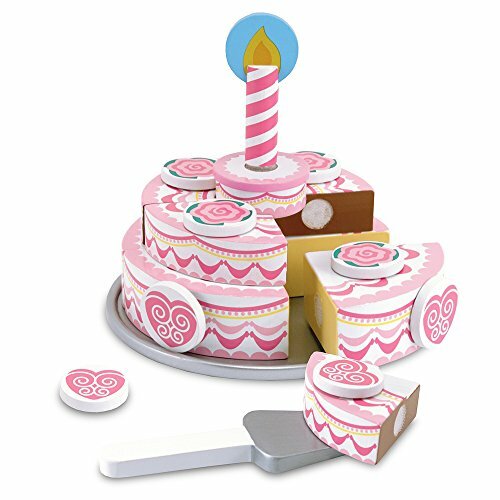 Why You'll Love It: Independent, pretend play is vital for young learners, and what better instruction tool than birthday cake? Kids develop crucial social and speech skills throwing imaginary parties and serving slices of cake. Plus, cutting the cake with the serving tool refines fine motor skills while also teaching counting and fractions. Bet you didn't know cake was delicious and educational! What's in the Box? Five pieces of cake, five candles, a serving tool, a cake platter, and a Happy Birthday decoration. Scrumptious Cupcakes Dessert Set!Don't these cupcakes look positively scrumptious? Add them to your next tea party for a colorful, sweet treat! Each cupcake has its own delicious flavoring to it. I'm sure you can't eat them all on your own, let's invite some friends over for a taste test!These scrumptious cupcakes are compatible with other Wood Eats! 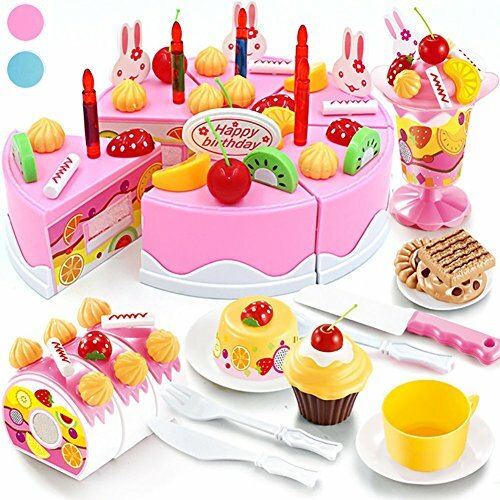 products as well as kitchen and play food sets. Playing pretend is a great way to think creatively and develop crucial social skills like sharing, and as always, Wood Eats! 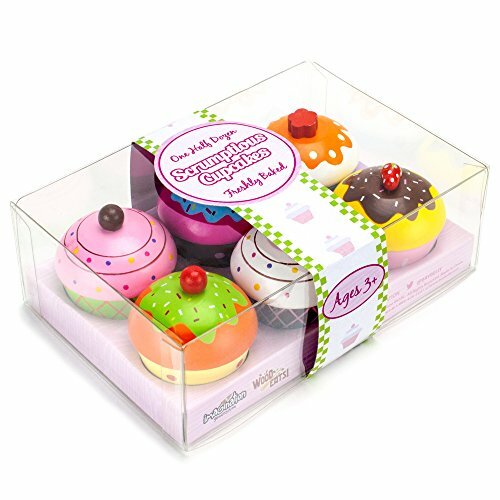 are made with real cuts of a wood and finished with water-based paints.Why You'll Love It:Little ones will enjoy the colorful, vibrant cupcakes and will want to share with all their friends and family! Watch as they pretend to bake just like you, they'll want to play with these while you bake real cupcakes. Six wooden cakes for children in a tray ready to be served at tea time! Ideal for creative role play sessions and to introduce the concepts of choice, taste and sharing. 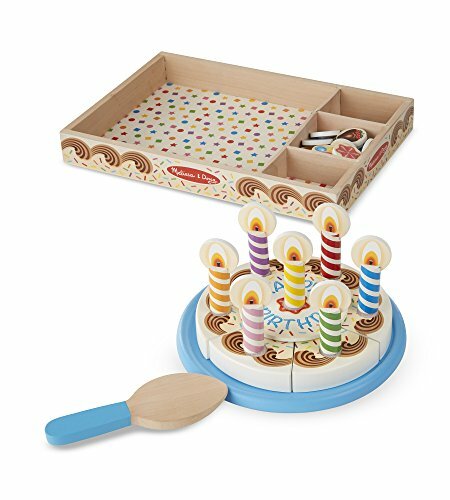 Perfect wooden play food accessory to any playtime kitchen or cupcake stand.Easy practical storage of toy cakes in a sturdy card board tray. 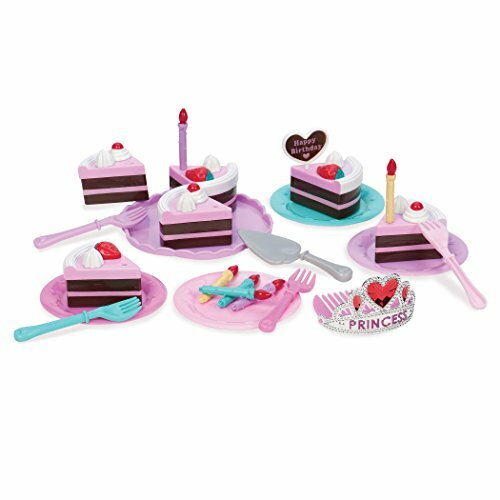 Wooden cakes set perfect to use for serving at tea time as pretend play food for role play.Toy food sets are ideal for creative role play sessions and introducing concepts of choice, taste and sharing. 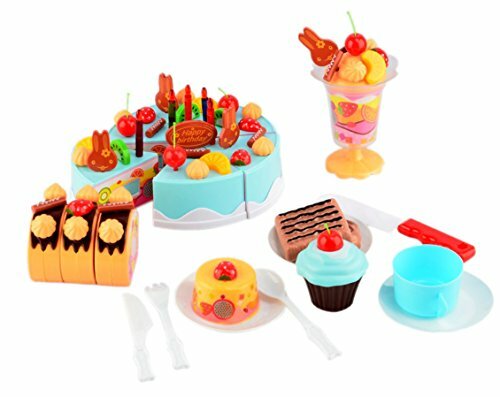 The kids play food /pretend food set explores role play and imagination. 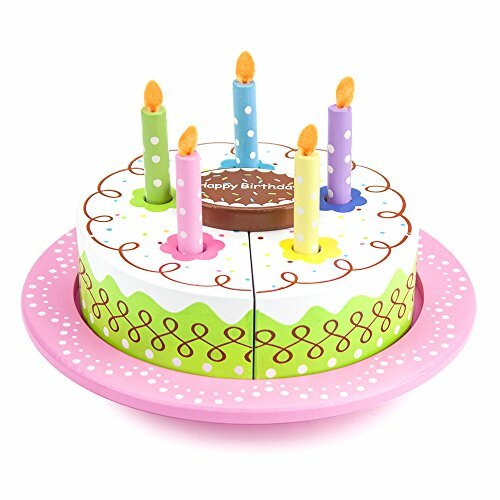 Wooden cake toy enhances hand and eye co-ordination and fine motor skills. Bee Smart wooden toys are made from high quality, responsibly sourced materials using non-toxic paints. Package Size: · 28.3 × 10 × 20.5 cm (11.14 × 3.93 × 8.07 inches) Color: · Pink · Blue Material: Non-toxic ABS Warning: CHOKING HAZARD-small parts,not for kids under 3 years. Should be used with adult supervision between 3-6 years old. 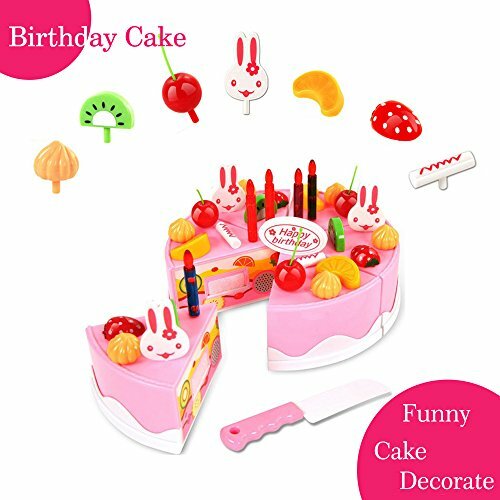 What You Get: 1 x Seoaura Birthday Cake Toy Set of 75pcs 100% Satisfied Service Not only we make preminum toy sets, but also we provide excellent customer care. We never let our customers down. If you have any question with our product or service, simply send us a message via "Contact Seller". Your problem will be solved within 24 hours. 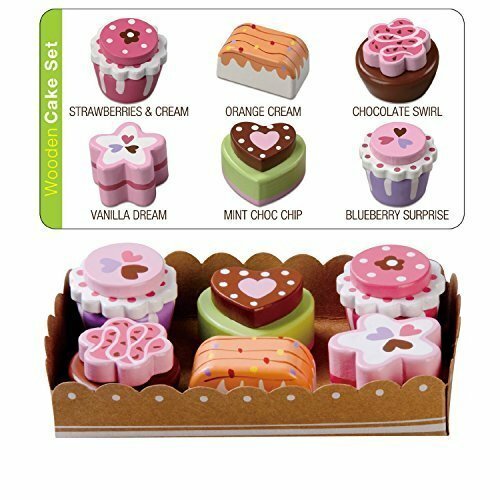 Looking for more Play Cakes similar ideas? Try to explore these searches: Tube Beads 15 Inch Strand, Peanuts 22 Oz Tin, and Duty Ceiling Hook. Look at latest related video about Play Cakes. Shopwizion.com is the smartest way for online shopping: compare prices of leading online shops for best deals around the web. Don't miss TOP Play Cakes deals, updated daily.